Thick, hempen line, system of blocks and 4 wooden wheels propelled by… workers walking inside. The mechanism of a medieval crane, lifting up to 4 tons as high as 11 meters, were also used for setting sails. 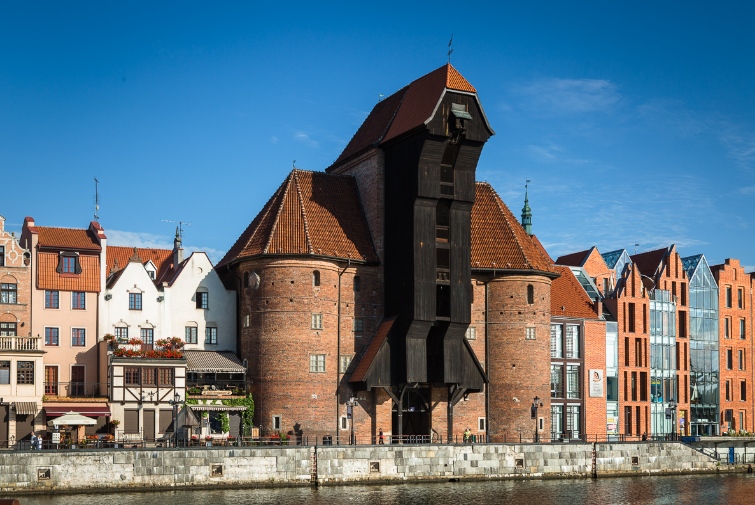 The crane is one of Gdansk trademarks and oldest, existing medieval crane in Europe. It was constructed in years 1442-1444, in a form of 2 brick towers. Between them, a wooden lift mechanism was installed. Its main purpose was to load and unload cargo but it was also a part of city fortification system and one of the city gates. Inside you will find an exhibition of a life of a port city from 14th till 18th century. A climb of narrow, wooden steps to the top of the crane (27 m) lets you admire a breathtaking panorama of Motława River, Granary Island and Ołowianka Island as well as yachts anchored in marina.